The goal which all the Vedas declare, which all austerities aim at, and which men desire when they lead the life of continence … is AUM. "The goal which all the Vedas declare, which all austerities aim at, and which men desire when they lead the life of continence … is AUM. This syllable AUM is indeed Brahman. Whosoever knows this syllable obtains all that he desires. This is the best support; this is the highest support. Whosoever knows this support is adored in the world of Brahma." 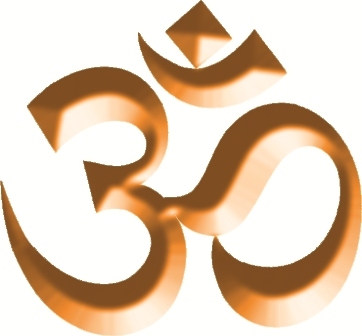 AUM or OM is of paramount importance in Hinduism. This symbol is a sacred syllable representing Brahman, the impersonal Absolute of Hinduism — omnipotent, omnipresent, and the source of all manifest existence. Brahman, in itself, is incomprehensible; so a symbol becomes mandatory to help us realize the Unknowable. AUM, therefore, represents both the unmanifest (nirguna) and the manifest (saguna) aspects of God. That is why it is called pranava, to mean that it pervades life and runs through our prana or breath. The Eternal Syllable: According to the Mandukya Upanishad, "AUM is the one eternal syllable of which all that exists is but the development. The past, the present, and the future are all included in this one sound, and all that exists beyond the three forms of time is also implied in it". AUM is not a word but rather an intonation. It, like music, transcends the barriers of age, race, culture and even species. It consists three Sanskrit letters, aa, au and ma which, when combined together, make the sound AUM or OM. It is believed to be the basic sound of the world and to contain all other sounds. It is a mantra or prayer in itself. If repeated with the correct intonation, it can resonate throughout the body so that the sound penetrates to the centre of one's being, the atman or soul. Om provides a dualistic viewpoint. On one hand, it projects the mind beyond the immediate to what is abstract and inexpressible. On the other hand, it makes the absolute more tangible and comprehensive. It encompasses all potentialities and possibilities; it is everything that was, is, or can yet be. It is omnipotent and likewise remains undefined. During meditation, when we chant AUM, we create within ourselves a vibration that attunes sympathy with the cosmic vibration and we start thinking universally. The momentary silence between each chant becomes palpable. Mind moves between the opposites of sound and silence until, at last, it ceases the sound. In the silence, the single thought—AUM—is quenched; there is no thought. This is the state of trance, where the mind and the intellect transcend as the individual self merges with the Infinite Self in the pious moment of realization. It is a moment when the petty worldly affairs are lost in the desire for the universal. Such is the immeasurable power of AUM .